Jack Mayfield sits in a cushioned chair on the top floor of Square Books with one hand resting on his knee. He speaks assuredly, and his eyes are wise. Pausing every few minutes to cough into the back of his hand, he profusely apologizes, explaining he has trouble speaking now after his bout with throat cancer. For a man whose job relies on conversation and storytelling, this ailment hasn’t slowed him down a bit. “My family history goes back to the beginning, when the county was formed,” he starts his story. Mayfield’s great-great-grandmother came to Oxford in the late 1830s as one of the first settlers in Lafayette County. 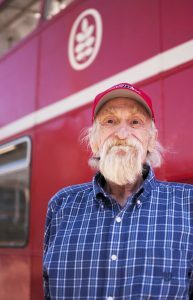 A fifth-generation Oxonian, Mayfield grew up in town and graduated from Ole Miss in 1969. After college he left Oxford, though he didn’t get too far. He worked office jobs in Jackson and Memphis for a number of years before returning home in 1990. When he came back home, Mayfield decided he wanted to teach, so he went back to school and earned his master’s degree in history. A love for the subject is deeply ingrained in Mayfield. After teaching at a few local schools such as South Panola High School and Northwest Mississippi Community College, Mayfield began writing a column for the Oxford Eagle in 2004. 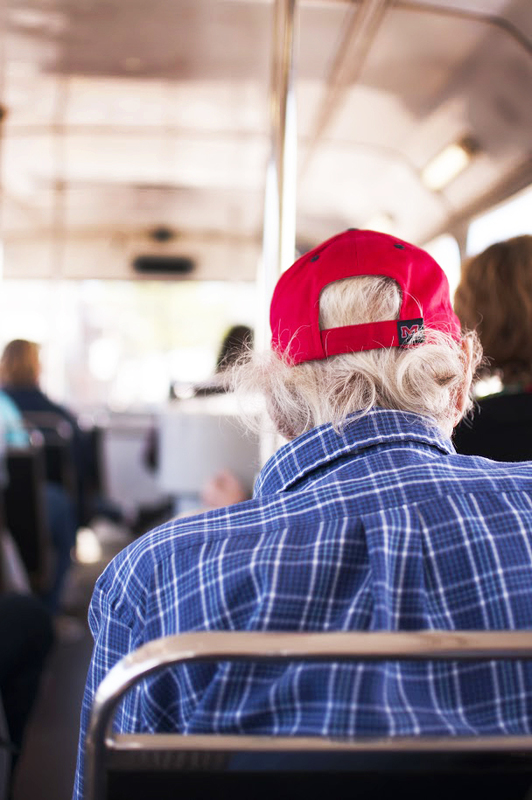 He did that for 12 years and wrote approximately 600 pieces before he received a call one day from Visit Oxford director Mary Allyn Hedges, who asked him if he could do a double-decker bus tour for a group. Mayfield has been leading bus tours ever since. Double-decker bus tours have been an iconic part of Oxford’s culture since the buses were imported from England in 1994. 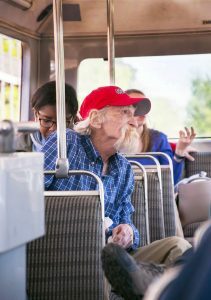 Usually starting at the Visit Oxford tourism office, the buses travel up and down the narrow streets surrounding the Square and venture onto campus so that riders can enjoy springtime views of the Grove. 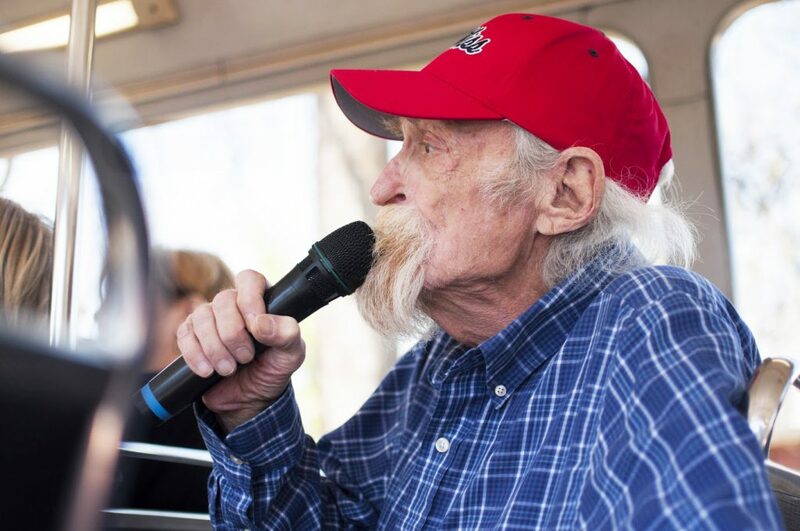 When Mayfield first began giving double-decker bus tours, he brought his grandson. During tours, Mayfield kept a stack of notecards containing important information he planned to mention during the tour, and his grandson wanted to hold the cards. On one of his first ride-alongs, Mayfield’s grandson accidentally dropped the stack, shuffling all of the notes. As luck would have it, Mayfield remembered enough to give the entire tour from memory. Since that day, his method hasn’t changed much. Throughout the approximately hour-long tour, Mayfield vividly describes historic events around town, recalls past Oxonians and their stories and cracks a number of jokes about his least favorite collegiate team: LSU. Oxford’s double-decker buses have served the town for more than 20 years and are considered a staple on the Square, especially during the spring. As popular as the buses are, however, local historian Mayfield is just as much of a local attraction as the buses. A true Oxonian, Mayfield lights up when he recalls the history of his hometown and the memories he has made in it. Part of Mayfield’s love for Oxford and its story comes from his close ties to the area. According to Mayfield, he grew up in Oxford during its athletic “heyday,” when everyone in Oxford was an Ole Miss fan. He remembers hundreds of fun days on campus, including one time in which he used a car hood to sled down a steep bank. Over the years, Mayfield has seen his town, his home and his campus grow to become, in his opinion, a better and more welcoming community. History isn’t the only thing keeping Mayfield here, though. He said the natural friendship and kindness among citizens of a town as charming as Oxford keep him here, and no one loves Oxford more than Mayfield.